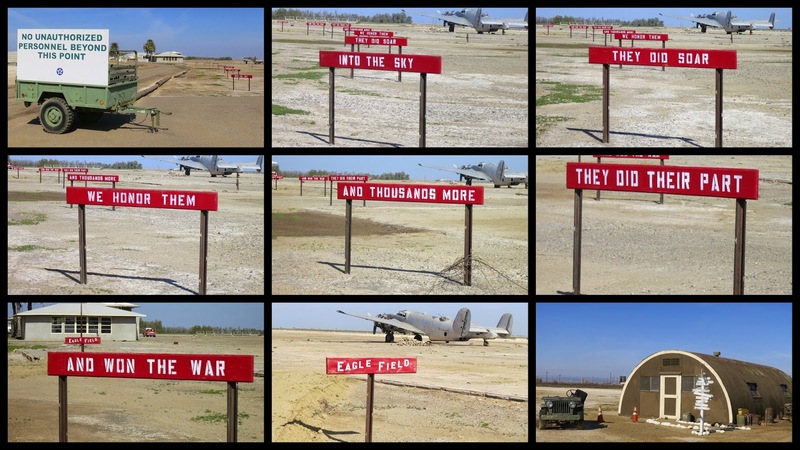 This WWII landmark had several unwelcoming signs at the (wide-open) driveway/front gate area, but their website seems to invite casual visitors, Nobody came out of a Quonset hut or anything to run us off so we went ahead and poked around long enough to document the faux Burma Shave signage. Maybe they figure there's just no fun in it unless you feel like you're breaking the rules? It was a weird place. I saw a couple of new cars parked in front of one of the hangars, but no other sign of life except for a small pack of listless dogs--they were too lazy and hot to either greet me or chase me. The size of America challenges the plans of travelers as much as their comprehension, and for scribes of the road it's useful to answer to an organizing principle before setting out in search of edification, although simply going forth blindly often is in itself an organizing principle, a common one that often translates into a wide-ranging circulation or occasionally into only a small rotation through a region...I want something looser, more serendipitous, more open to vagaries, more embracing the vagrant because that's the way life works. An ideal approach might be to go aloft in a balloon, a craft dependent on capricious winds for direction, and at some unappointed moment be pitched out of the basket to parachute into whatever territory lay below and, unbuckling, say, "Well, look where the hell I've landed this time." Could we as newborns speak, many of us just might utter that very sentence with our first breath. That's a well-written expression of something that is fairly hard to encircle with meaningful prose. Cutting to a more prosaic example, kinda like Then Came Bronson, though without the wool hat.